Miso soup has always been one of my favorite things when we go to Japanese restaurants. And, this Miso Ramen makes it a whole meal in a nice hot bowl of soup. I got to have some miso soup on Day 11 of the healthy clean eating cleanse, so I was reminded of how tasty it is! Sometimes we add ½ cup frozen peas. Sometimes we add a beautiful poached egg or two on top. You could also add carrots, broccoli, bamboo shoots, baby corn, or water chestnuts as your heart desires. To get the dried ramen noodles, I buy those really cheap packages of ramen that you can make on the stove, and they’re about 30 cents each. I take the flavor packet out and throw it away (or in the compost). It’s really high in sodium, and has very little redeeming value, so I don’t feel too bad doing this. 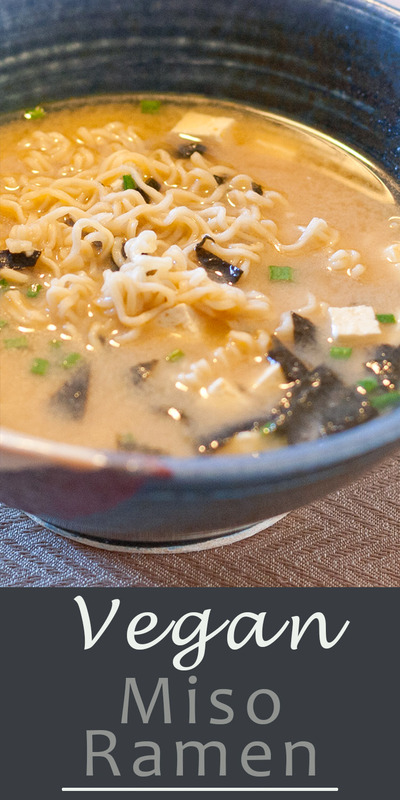 Replacing the flavor packet with miso is a much healthier choice. Miso is high in vitamin B12, low in calories, a decent source of protein (2 grams of protein for just 25 calories). And, it’s so much tastier than those packets. Place the chopped seaweed in a small bowl and cover with ½ cup tap water. Set aside. Pour the broth or water into a pot and bring to a boil. Add the ramen noodles, and cook for 3 minutes, breaking noodles apart as the cook. Turn the heat to medium-low and add the soaked seaweed, the soaking liquid, and the tofu. Simmer for 2 minutes. In the meantime, place the miso paste into a bowl, and carefully add ½ cup of the hot broth. Whisk the miso paste into the broth so that there are no clumps left, and it’s a smooth mixture. Carefully pour the ramen, tofu, and remaining broth into the bowl with the miso mixture. Top with chopped green onion, & enjoy! I love a good miso soup, and this looks mouthwatering! Thanks for sharing this with Sunday Night Soup Night, look forward to seeing you again soon! Miso soup is one of the things I miss most about NY. This soup reminds me of a Thai restaurant in NYC called White Ginger. They had a very similar Miso Soup and now I am feeling home sick. I will make your recipe soon. I made this tonight because I had all the ingredients in the house; except ramen noodles, I subbed chow mein noodles. It was great, very tasty, but next time I will make it with ramen noodles.